Earth Essentials Top Soil may be used to fill in low spots in lawns. Simply place the product in the low areas. If there was no existing grass, add grass seed prior to using Earth Essentials Top Soil. Follow directions on grass seed packaging. Adding Earth Essentials Top Soil to any existing soil will improve the soil. Top Soil has traditionally been used as an all purpose amendment. The Richlawn Company recommends specific products that will have better performance in bedding plant and other areas. See other products in this website for specific information. Earth Essentials Top Soil will slowly release nutrients to your plants. 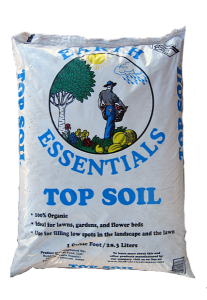 Earth Essentials Top Soil is a premium Top Soil. Earth Essentials Top Soil contains compost, bark fines and soil. Earth Essentials Top Soil is a thoroughly composted product which helps eliminate weeds, seeds and other pathogens that may be present in other amendments. The Richlawn Company encourages you to open a bag of our Earth Essentials Top Soil and compare it to similar products available. We are confident that you will find these products to be the best available.